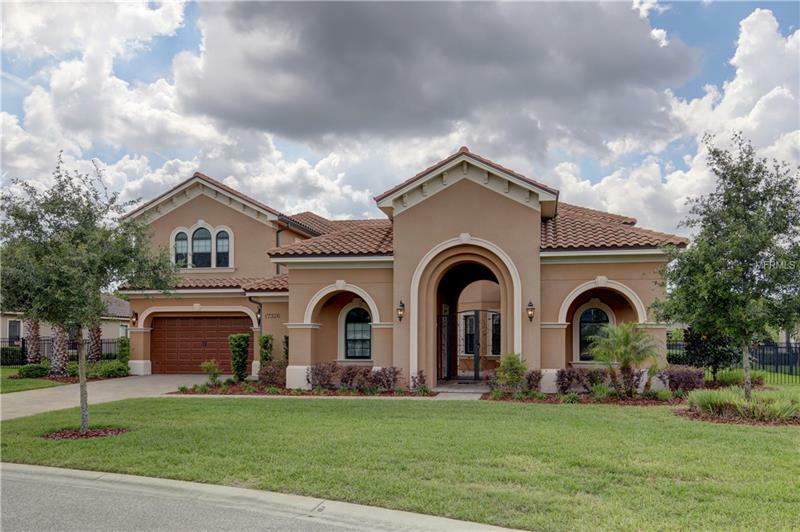 17326 Ladera Estates Boulevard, Lutz, FL.| MLS# T2937367 | Westchase Real Estate - Westchase FL Homes For Sale - Westchase Local Experts. Move-in-ready Executive Home! This 5 bedroom 6.5 bath, +Office, Play room and Media room is nestled within the exclusive Gated community of Ladera Estates. This home displays endless fine details. Walk in through the gated courtyard to the double glass doors to a two story Rotunda where you are immediately welcomed by a grand stair-case, views of the pool with fountain and pond. The chef inspired kitchen presents high end stainless steel double oven, gas range with griddle and granite stone counter-tops, an abundance of cabinets, gorgeous light fixtures, island with prep-sink, and a walk in pantry with built-ins and wine fridge. A screened outdoor living space, with outdoor kitchen, pool, and Pool Bath, overlooking a pond and completely fenced in backyard. Embrace the split floor plan and retreat to the master suite with an generous closet complete with built-ins, tranquil master bath with spa tub and luxury finishes, with access to lanai. Upstairs bedrooms feature en-suite baths, walk-in closets and linen closets. Large Laundry room with additional storage. Tesla charger in garage. 'Control4 Home Automation' system. Ladera is a lakefront community that embraces the natural surroundings of its convenient location, yet displays the luxury lifestyle of modern living, and has recently completed construction. Steinbrenner High School District. Conveniently located near major access roads, shopping and restaurants. 20 minutes to Citrus Park Mall or Tampa Premium Outlets, 30 minutes to air-port/downtown. Additional Water Information: Community Dock with fishing and non-motorized water craft allowed.